Blade height (at heel): 0.71 in. The blade incorporates a complex Damascus pattern that Bill calls Dragon's Breath. 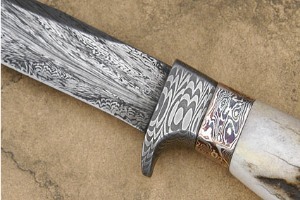 Swirls of flame move through the blade, incorporating both complex and bold Damascus patterns. 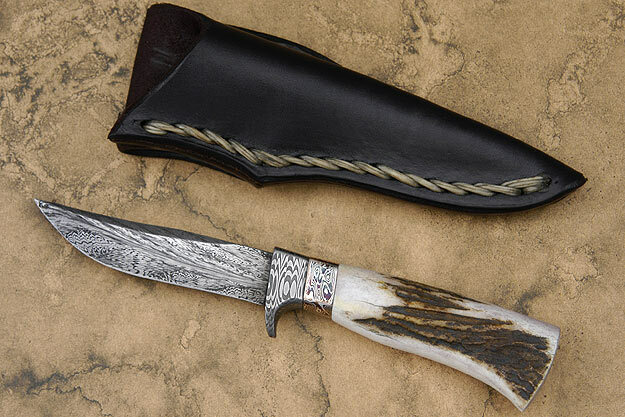 Like his Pronghorn Hunters, this knife was pre-tested for edge flex and cutting ability before assembly. The heat treat follows the formulas developed by Ed Fowler, Bill's teacher, and has been proven to create some of the sharpest and most long lasting edges found anywhere. 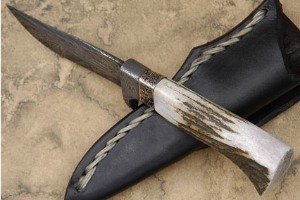 The dramatic guard is also formed from Damascus and nicely complements the mokume ferrule. 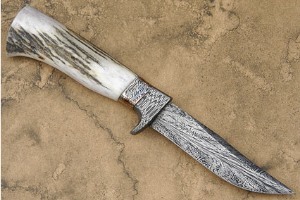 This mokume is extremely rare and was also created by Bill. Instead of combining copper with nickel silver and brass, Bill has combined silver with shakudo (a mixture of gold and copper). The resulting tones and pattern are exceptional. The handle is finished off by a stag handle. Exceptional fit and finish throughout! 0.203125 0.09375 203.125 93.75 Trailer Started.